An interactive glow-in-the-dark children’s book exhibition installation. 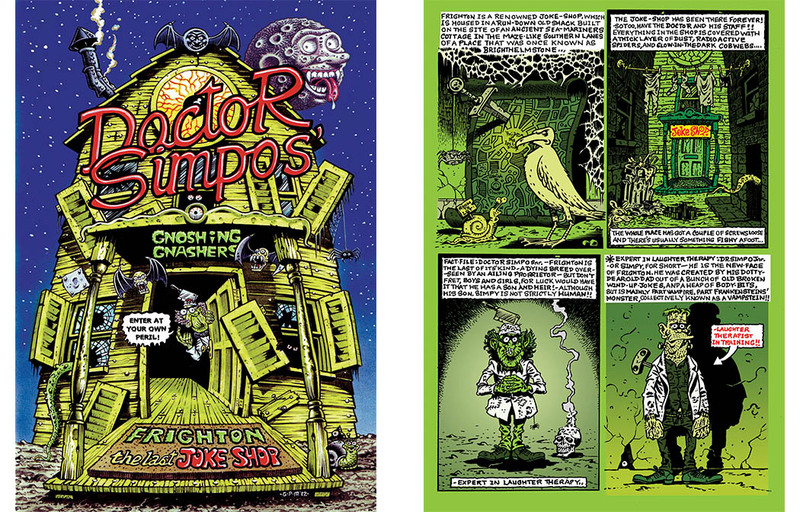 From a humble Joke Shop in the Brighton Lanes, Doctor Simpo (Ben Simpson) has taken his wacky sense of art and creativity to Leeds Arts University for his seminal solo show: The Norms, as he makes the move ‘back up north’. We travelled all the way up to Leeds during Thought Bubble Comic Art Festival for a little visit to discover what had become of the cartoonist and retro joke shop proprietor. We even manage to catch his artistic talk as he spoke on his influences and teaching career, celebrating 18 years since he graduated from Leeds Arts University, The Glasgow School of Art, The Pratt institute and The Royal College of Art. 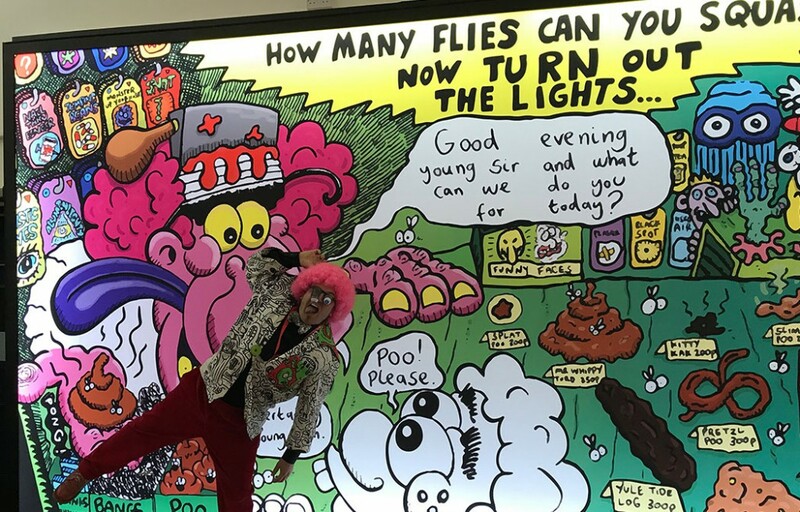 As we entered the foyer the first thing you notice is the huge light boxes on the wall (also featured as part of Light Night Leeds 2018) which gave you a sense of the styles and teachings Doctor Simpo delivered. “Presently I am a Senior Lecturer on the BA (hons) Animation course and have been charged with delivering the history of Comics and Concept Art on the new BA (hons) programme of the same name, both are equally as exciting as the other, and I am getting the chance to impart my extensive knowledge in both areas on the future bright sparks of those industries.” Simpo went on to say, “The main purpose of this exhibition was to take a cartoon world out of a predetermined cartoon format and allow it to escape from the screen or print mediums and see how people responded to a real cartoon environment, not a VR one but an analogue one. I wanted to show the present cohort of students how far you can really take an idea and demonstrate to them that what starts out as a back of a beer mat doodle can go onto to become, fingers crossed, a celebration of ‘tangible and tactile’ filmic techniques suitable for a fully immersive and interactive kid’s TV show.” Simpo animatedly explains. Dotted around the venue you can find all sorts of memorabilia and retro toys that inspired him over his career, including objects from his childhood and from the joke shop; that presently exists in the back of a 1965 Bedford CA Debonair Camper Van. Visitors can peruse through collections of sketches and comic artworks he has created over the past decades, including special commissions and short animated unrealised projects being played from a VHS tape on a 1970s black and white TV. 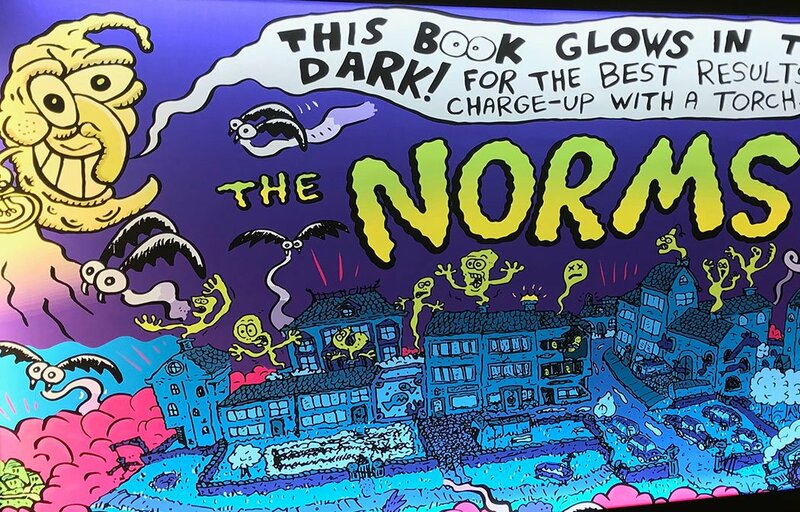 The main attraction is his self-titled interactive glow-in-the-dark book – The Norms with accompanying animated title sequence. NORMS INTRO from Doctor Simpo on Vimeo. The kids seemed to love the silliness and the interactive elements as they got creative with free Make-a-Monster kits. Whilst the parents enjoyed the nostalgic visions and creativity. The exhibition is on Monday-Friday 8.30pm – 7pm until Halloween and culminating in an adult only talk on ‘40 years of Scottish Underground Comix’ 3 – 6pm and closing drinks from 6 – 7pm at Vernon Street Gallery and Lecture Theatre, there will also be the brand new mini-limited-edition-comic launch of Doctor Simpo’s Frighton: The Last Joke Shop.